The latest NSC was held on August 7–11, 2010 at the Hotel InterContinental Dallas at 15201 Dallas Parkway in Addison, TX. Nigel Richards won the $10,000 first place prize, and soon moved on to the 2010 World Players Championship (WPC). 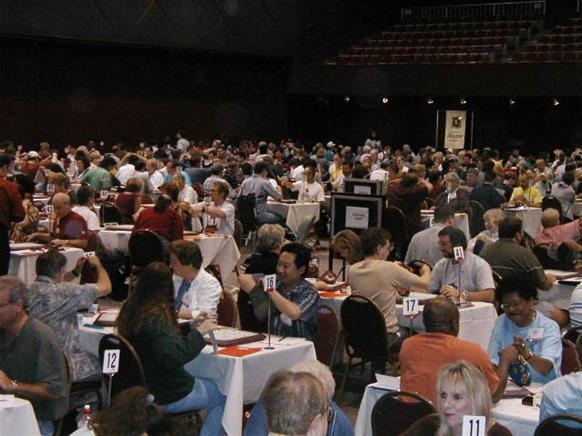 If you think you have what it takes to compete in the 2011 National SCRABBLE Championships, it's time to get yourself a rating, or you're just another SCRABBLE genius without anything to show for it. So, how do you earn a SCRABBLE rating? In the past, players needed a National SCRABBLE Association (NSA) Official Rating to enter the NSC, but that has all changed now, thanks to Hasbro. The NSA was directly sponsored by Hasbro, who provided funding which allowed the NSA to govern all SCRABBLE Official Tournaments and Clubs in North America, including the NSC. It was the only organization running licensed SCRABBLE activity in the United Stated and Canada. But in January, 2010, Hasbro dropped regular funding to the NSA, and in turn, the NSA forfeited their command. Hasbro and the NSA (still operating under Hasbro's direction) are now focusing their moneys in recruitment tactics and endorsing and governing school clubs and tournaments, like the National School SCRABBLE Championship, along with casual SCRABBLE play. So, if the NSA doesn't provide SCRABBLE ratings anymore, who does? With the anticipated lack of funding from Hasbro, the NSA transferred responsibility for official clubs and tournaments, over the course of 2009, to the newly formed North American SCRABBLE Players Association (NASPA). Since funding is no longer provided by a powerhouse such as Hasbro, the NASPA runs off the fees imposed on its members. An annual membership costs $30 US (regardless of residence: US, Canada, overseas) and a $0.50 US fee, per player, for every game played. Without paying these fees, you will not be able to play in sanctioned tournaments and have your personal achievements officially recognized. Okay, so now that that's out of the way, how do you get an "Official SCRABBLE Rating"!?! The answer is simple: Play in any rated tournament affiliated with the NASPA. That's it — besides paying membership dues, as stated above. Basically, you can't play in the SCRABBLE Championships until you have earned a rating, and you can't earn a rating until you have played in one NASPA-sanctioned tournament, and you can't play in NASPA-sanctioned tournaments until you have paid your dues. You will enter your first tournament game as an "unrated" player. Now that you've paid NASPA dues, where do you find these SCRABBLE Tournaments? 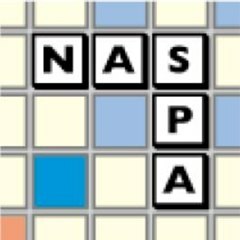 To find a tournament to earn your very first SCRABBLE rating, check out the NASPA Tournament Calendar. It provides you with information on all upcoming sanctioned tournaments. So, what about these ratings? How exactly do they work? Well, as an unrated player, your rating will first start to grow after your first tournament game. As you continue to play in NASPA-sanctioned tournaments, your rating matures based on your wins and the ratings of your opponents. This numerical rating decides which level you will be placed in tournaments, and also determines if you qualify for certain tournaments, such as the World SCRABBLE Championship (WSC). NASPA provides a Rating Calculator to see your progress. But how is the rating determined? Figuring out your Official SCRABBLE Rating is not as simple as one might think. As stated before, your numerical rating is based off your initial tournament rating, then the rating of your opponents, and next your win-loss record. To fully understand the mathematical calculations of ones NASPA SCRABBLE rating, it's best to visit the source for answers. Check out the Overview for the ratings system directly from NASPA. But that's for those who already have a rating. To find out how one computes an "initial" rating, which is ten times more complicated, check out the page (a detailed description) on how an Initial Rating is determined, in pseudocode. For more general information on SCRABBLE ratings, visit the Ratings page, which also includes a list of monthly rankings for official tournaments, and check out the Tournament Results page for detailed results, also known as "cross-tables". Scrabble Adventures: The Adventures of a Tournament Scrabble Player is a great place to learn about tournament play through personal experience. There's an article entitled "A closer look at Scrabble ratings" that picks apart the statistical rating system, and tells you the (possible) secret behind raising your tournament SCRABBLE rating, which is as simple as "opening" the board up. "...when experts suggest playing a more open style, they do so because an open game plays to their advantage because they can score more. 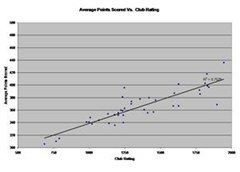 That's why they can get scores in the high 400s, 500s, and even 600s while lower rated players struggle to reach 400. To get better, the best way would be to improve your ability to score rather than trying to limit your opponent from scoring." Also, check out this fun thread started on Facebook for SCRABBLE Beta: Scrabble for Beginnerds 101: Ratings, The Elo System. So, now that you know all the facts, what now? For more information, visit the NASPA FAQ from their website and SCRABBLE FAQ provided by Steven Alexander. Also check out some interesting and funny facts about SCRABBLE and its history.